Over the last 4 months, a record-breaking 115,000 asylum-seekers arrived in Sweden. Among them were 26,000 unaccompanied children, enough to fill 1,000 school classes, Morgan Johannson, Swedish Minister for Justice and Migration, told the Brussels press yesterday (6 January). Johannson spoke at a press conference with Migration and Home Affairs Commissioner Dimitris Avramopoulos, Danish Immigration Minister Inger Stoejberg and Ole Schröder, Parliamentary Secretary of State at the German Federal Ministry for the Interior. Neither of the participants took questions. Schröder said that European policies to tackle the refugee crisis are not working properly, and as a consequence, the number of refugees arriving in Germany has not declined. Johannson said the situation in Sweden became very difficult this autumn. “We had last year 160,000 asylum-seekers, which is the highest number ever in our country. It’s double the previous record. And if I just count the last four months, we have 115, 000 asylum seekers. And if (we) just count the unaccompanied children and minors, 26,000 unaccompanied children and minors came. 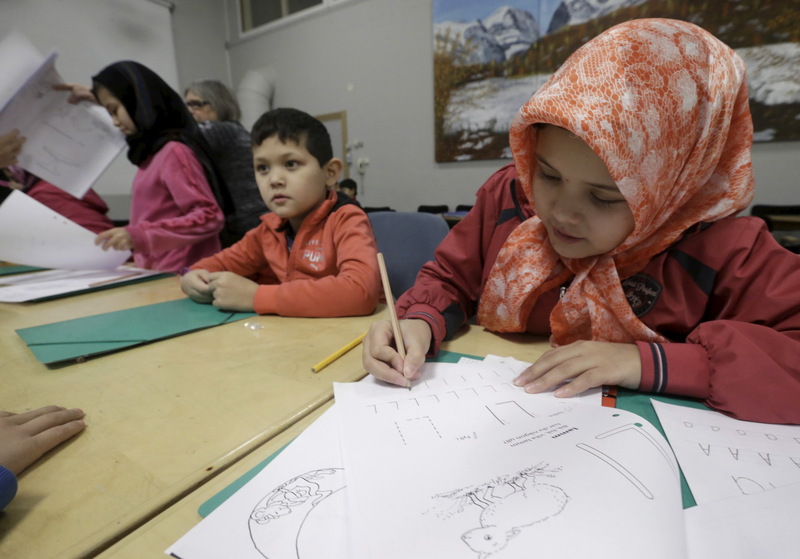 That’s 1,000 school classes arriving in Sweden in four months,” the Swedish minister said. Unaccompanied children and minors are seen as the most vulnerable victims of the Syria conflict. In a report published on Tuesday, Britain’s International Development Committee (IDC) said it is particularly concerned about the plight of refugee children who have been left to fend for themselves in Europe. The IDC warned that many of these youngsters are vulnerable to prostitution, child labor and the drugs trade. Johannson made an appeal for an European solution to the refugee problem. “I don’t want to get to that situation again. We have to put measures in place, work together,” he said. He pleaded that the principle that asylum-seekers should apply for asylum in the first country where they arrive should be the rule, that the Dublin regulation on asylum should be enforced, and that the flow of refugees should be slowed down. Johansson spoke of a “highway” of refugees that’s now been installed through Europe, from Greece via the Balkans to Austria, Germany and the Nordic countries. “We need measures to prevent that from continuing,” he said, and pleaded for strengthening the EU’s external borders. The Swedish minister said his country was counting on the relocation mechanism. Last September, the EU heads of state and government agreed to relocate 160,000 migrants from Italy and Greece to other countries, in the course of the next two years. However, up to now only 272 migrants have actually been relocated. Sweden has asked, and the Commission has accepted, that it would be excused from the obligation to take refugees under the relocation scheme, and that instead, refugees from Sweden would be relocated to other EU countries. “We are the country that has taken most refugees per capita, not only last year, but for a number of years. We can do a lot, but we cannot do everything. That’s why we need the relocation system,” Johansson said. Dear Euractiv, by publishing such kind of video, without explanations and police right to answer, you give us the right to doubt of your moral and political integrity. All around Europe, tens of thousands children under 18 years are stealing, band aggressing aged persons or prostitute themselves! You should not be proud of this kind of confusion (subway thefts and migrants problem). That’s a very fortunate child to be in Sweden because if he had been in the US the police would have shot him at least a dozen times.